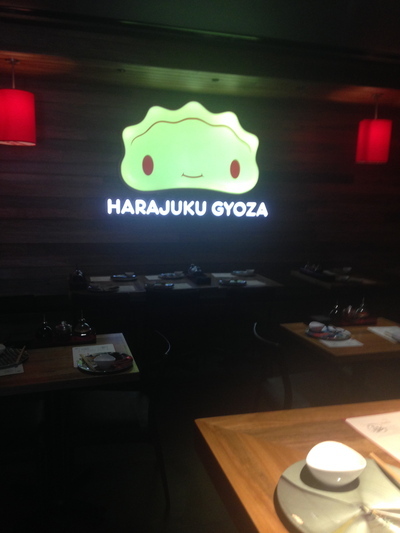 Welcome to Harujuku Goyza at Potts Point. Perhaps, in other words - a warm, almost deafening Japanese welcome to you as soon as you enter this chic Japanese food joint. Just joking on the latter, yet the welcome was fairly loud - to the point where the consistently friendly service arrives in an outstanding way at this newly opened establishment. You have the choice of either a more civilised sit down experience, or perch yourself on one of the stools at the bar area. The ambience is dark, yet rather welcoming simultaneously. 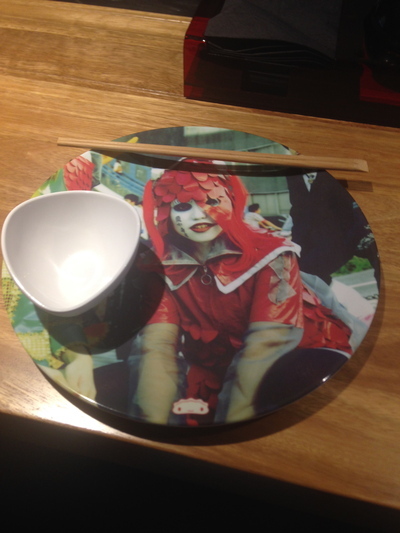 Gorgeous plates. So cool, I want to take one home with me. Your 'host' welcomes you yet again and explains the simple menu, with some dish recommendations. It is crazy. 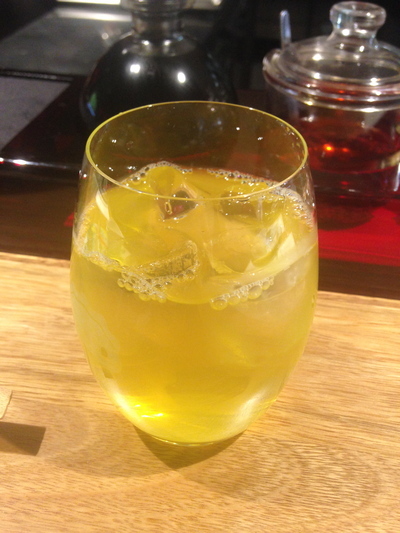 Japanese 'social' food with a twist. Forget about the sushi fare. You're encouraged to have 'fun' by eating bucket loads of good, fresh Gyoza fare - or anything else on the menu to the likes of any of their salads, as well as the Chicken Karaage. Seriously, my 'host' must have worked at McDonald's in a previous life. I came out eating more than I anticipated for a rather 'light' lunch the other day. The add on selling technique worked - on me. On the Gyoza menu, the Lobster Tail Gyoza ($12) is a recommended dish. 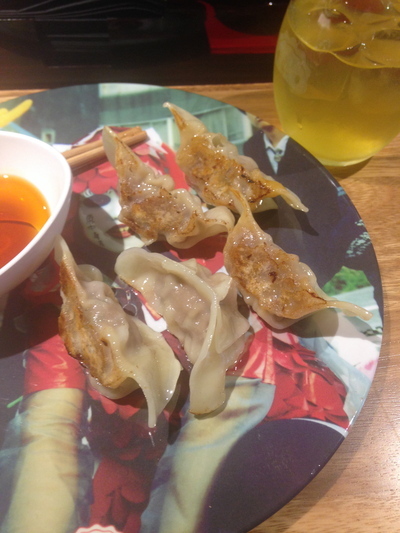 Instead, I went for the Grilled Duck Gyoza (five pieces for $8) - and there were no regrets. Sydney, you know that 'salted caramel' is a sweet food trend right now. Yes, the Salted Caramel Gyoza with Ice Cream ($9) was a recommended dessert option. Skipped the desserts and went for the Miso Soup ($3). Okay, so $11 spent so far - to now add some Iced Green Tea ($3) to the mix. The tea was surprisingly good. A little sweet, yet rather refreshing. There might have been a bit too much ice, yet I loved the fancy glass. It gelled in so beautifully with my fashionable plate, to see the logo right at the bottom. Loved it. 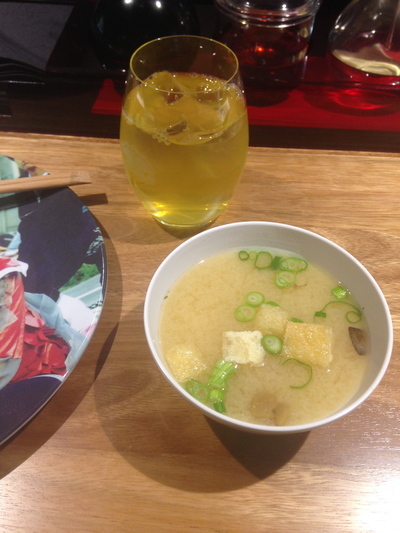 My Miso Soup also arrived quite quickly. Quite tasty, although it could have been a little warmer with some smaller chunks of tofu. Otherwise awesome. 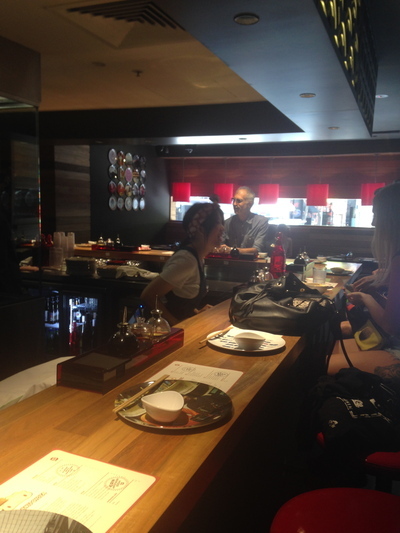 The problem was that I quickly devoured my Miso Soup, and the Gyoza's took a while - considering that the staff were not run off on their feet on this occasion. Then again, duck can take a bit of time to cook. I loved the duck, it was cooked just right. The parcels of pastry were fresh. Quite delicious, and my 'host' did thank me for my patience. You're encouraged to mix the sauces, and there was a bit of pepper at the end of my dish. I had no need to use the latter. The staff explain how the sauces work. Chose some vinegar, with some soy and a bit of chilli. My lips did burn a bit, yet this combination was a perfect dipping companion for the main dish. A great place, and well worth a visit. 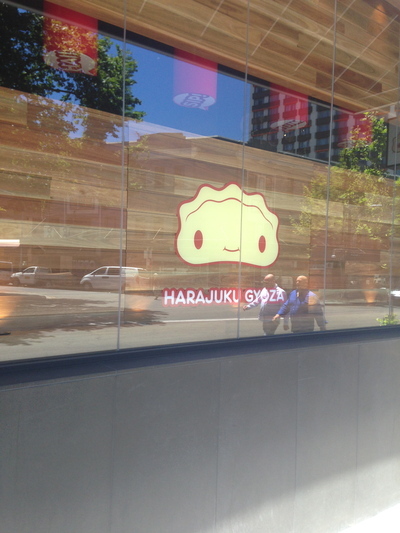 Where: Harujuku Gyoza, 15 Bayswater Road Potts Point NSW. Right near Kings Cross train station. 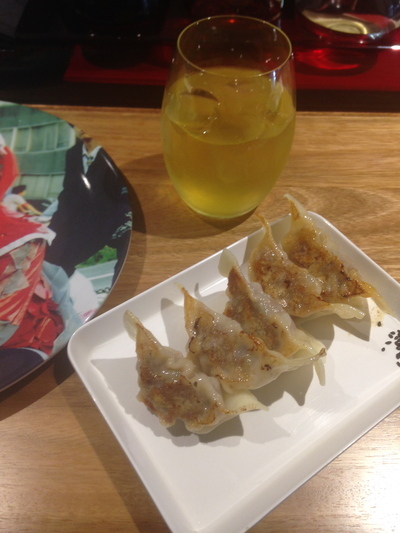 Why: For their iced green tea and smashing Gyoza's. Good for kids: No, not really. Take away: Not sure - did not worry about this.